As the year starts to wind-down, we at the Creative Coalition start thinking about our goals for 2019. And, one vital goal is to welcome new people to our dynamic Board of Directors. We currently have five incredibly invested Board Members and we hope to gain several more to steward our non-profit organization into a fruitful future. NFVCC Board of Directors provide organizational and fiduciary oversight while driving the organization to fulfill its mission. Our Mission is to elevate the arts and creativity in the community by supporting and expanding the impact of creative industries and bolstering investment, job growth, and local incomes. We need people who are passionate about community and economic development, as well as the creative sector. 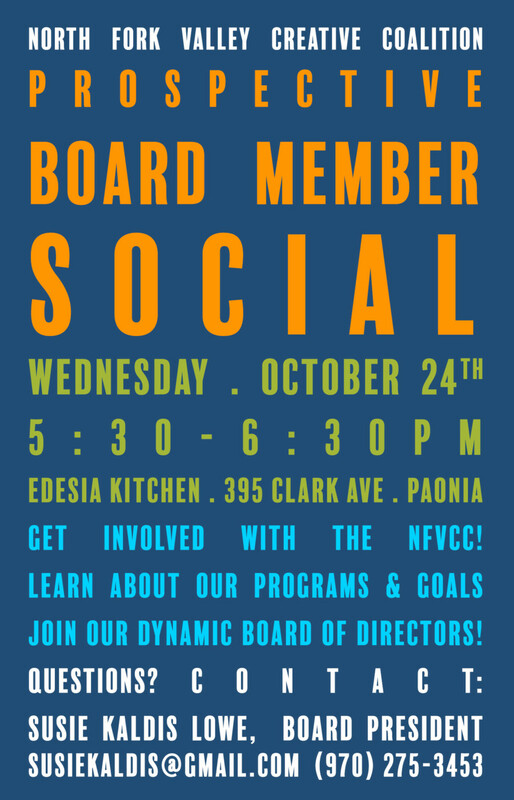 If you have an interest in learning more about the Creative Coalition, please join us for a “Prospective Board Members Social” event on Wednesday, October 24th at 5:30pm at Edesia Community Kitchen (395 Clark Avenue, Paonia, CO). If you have questions, please contact me at: susiekaldis@gmail.com or (970) 275-3453.